Terrorists had planned to hit France's main airport next. Overnight developments in Paris: reports the mastermind of the attacks "killed" and second terror cell neutralised. Hours after a predawn raid in Paris details are emerging about a second terror plot. 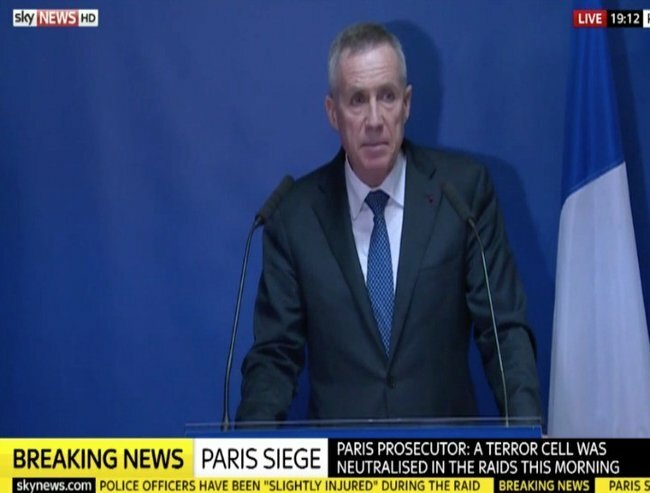 The French Prosecutor has given a press conference detailing the “war arsenal” held by the terror cell. Suspected architect of the Friday attacks Abdelhamid Abaaoud of the Paris attacks is dead some media outlets are reporting. His cousin, Hasna Aitboulahcen, blew herself up during the raids after yelling “Help me help me.”. Dramatic predawn raids by French police commandos upon a Paris apartment on Wednesday have allegedly killed the ringleader of last week’s deadly terrorist attacks and thwarted a planned attack on France’s main airport Charles de Gaulle. The raid came days after an orchestrated a wave of coordinated attacks through Paris that killed at least 129 people. Police swooped on the building in the northern suburb of Sant-Denis after phone conversations indicating a relative of Abdelhami Abaaoud, the suspected mastermind of last Friday’s Paris attacks might be there. Police swoop the area. Via CNN. CNN reports that the second terror cell found at the apartment were “about to move on some kind of operation” believed to be a terror attack at Charles de Gaulle Airport and at a shopping mall in the business district. 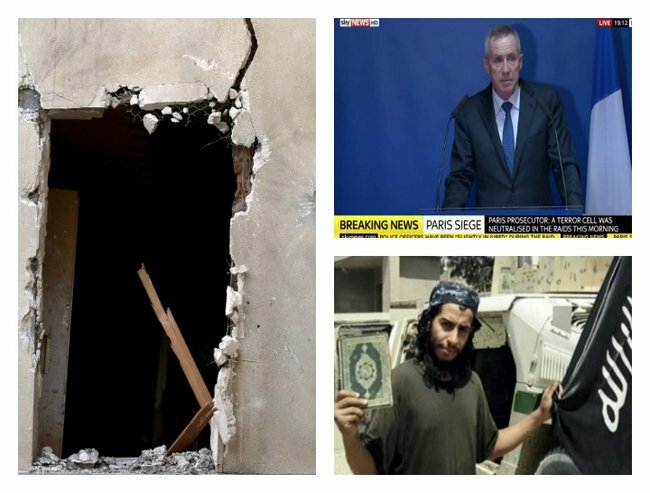 Two people were killed, including a female suicide bomber and, as reported by The Washington Post, Abdelhamid Abaaoud – but yet unconfirmed by the French prosecutor. 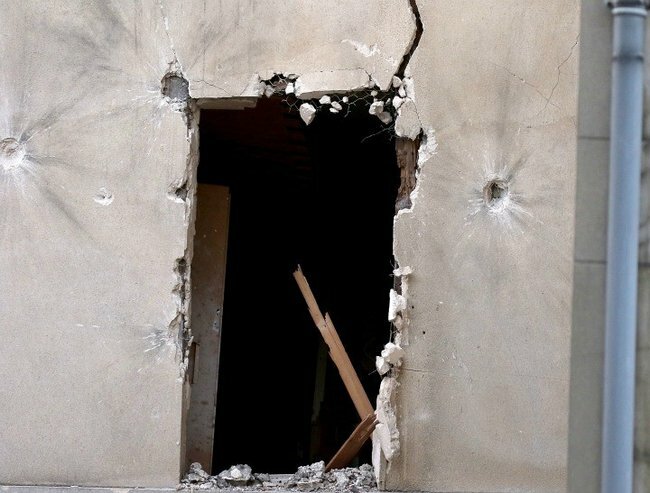 The Washington Post reports that the confirmation was made after forensic experts combed the Saint-Denis flat. Though other sources are reporting that until DNA can be forensically examined there is no way of knowing if it is Abaaoud or not. In the past he has faked his death in order to escape capture. Five were arrested as 110 police descended on the area. The prosecutor said there were 5000 bullets fired. He said the terrorists had a “war arsenal” in the apartment. Molins said that security forces found “a total war arsenal” including “assault rifles of the Kalashnikov model and explosive belts” in the Saint-Denis flat raided this morning. Aitboulahcen had been under “triple surveillance” from French intelligence, judges and the police for drugs running and terror probes. Abdelhami Abaaoud the ringleader of the terror cells. “The police asked her to identify herself, and to show herself. She held her hands up but she didn’t reveal her face. “She withdrew her hands out of sight, and then put them up again several times. An amateur recording obtained by TF1 then shows the final exchange between police and Hasna Aitboulahcen shortly before she blew herself up. Then a hail of gunfire and the detonation of her vest. Reports are emerging that the suspected ringleader Abdelhamid Abaaoud could have been the man killed alongside the female suicide bomber. 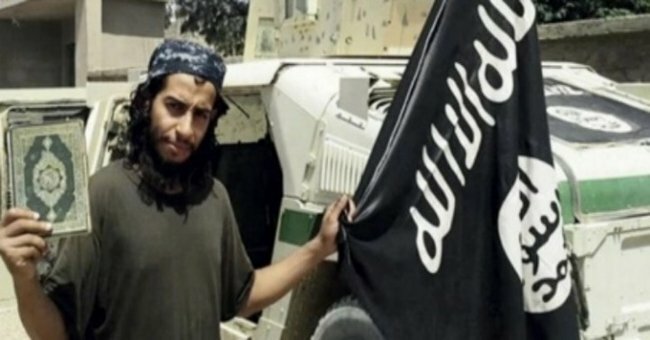 Abaaoud, believed to be in his late 20s, is close to ISIS leader Abu Bakr al-Baghdadi, and is thought to be the link between the senior ISIS leadership and ISIS operatives in Europe. The French Prosecutor said that Abdelhamid Abaaoud was not among those arrested, but said they could not yet identify the body of the person killed indicating that he could have esacped – or could yet still be identified as the dead body. 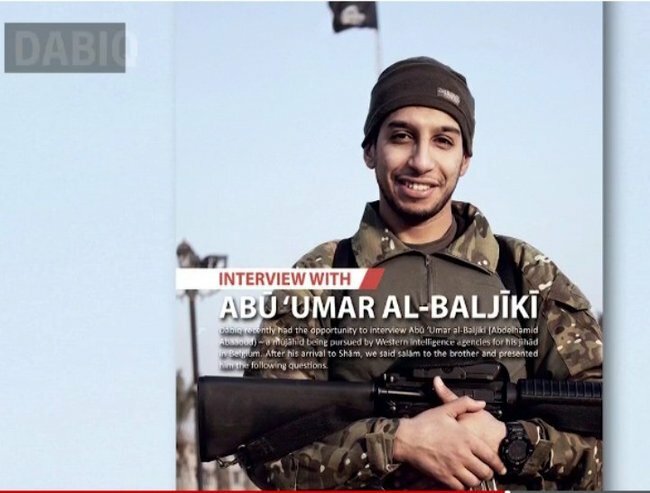 In an interview with ISIS’ English-language online magazine Dabiq in February Abaaoud bragged about being able to enter Europe and return to Syria at will. “I was able to leave and come to Shām (Syria) despite being chased after by so many intelligence agencies. My name and picture were all over the news yet I was able to stay in their homeland, plan operations against them, and leave safely when doing so became necessary,” Abaaoud claimed in the interview. Interior Minister Bernard Cazeneuve said there could end up being more than the two suspected terrorist deaths. Five French officers, meanwhile, were slightly wounded, while a police dog died in the operation. The suspects were planning to attack Paris’ airport and the Les Quatre Temps shopping center in the city’s La Défense neighborhood, police sources told French public broadcaster France 2. Police uncovered a huge arsenal of weapons in the raids. “These actions confirm to us once again that we are at war, a war against terrorism, which itself has decided to bring war to us,” he said. He also promised to take in 30,000 new refugees over the next 2 years, saying that they, too, are victims of terror. 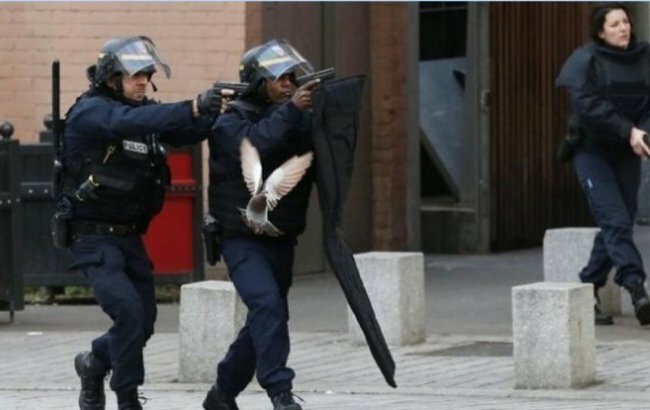 French police have carried out 414 raids and made 60 arrests while seizing 75 weapons since Friday. 118 more people have been placed under house arrest in another of the new powers permitted under France’s state of emergency. The French Liberation newspaper reports that there have been two raids in Roissy, where Charles de Gaulle airport is located. One was on the cargo wing of Air France, and another at premises belonging to the Fedex company. Authorities in Europe are being asked to be on the lookout for Salah Abdeslam, a 26-year-old Frenchman wanted in connection with last week’s attacks in Paris. Two Air France flights bound for Paris from the U.S. were diverted Tuesday night. French fighter jets attacked Islamic State targets in Syria for a third night. The French defense ministry said 10 jets had hit two Islamic State command centers in the militants’ base of Raqqa, Syria.